Participants of the Little People’s Golf Clinic held at White Pines Golf Course in Swanton gather for a photo. 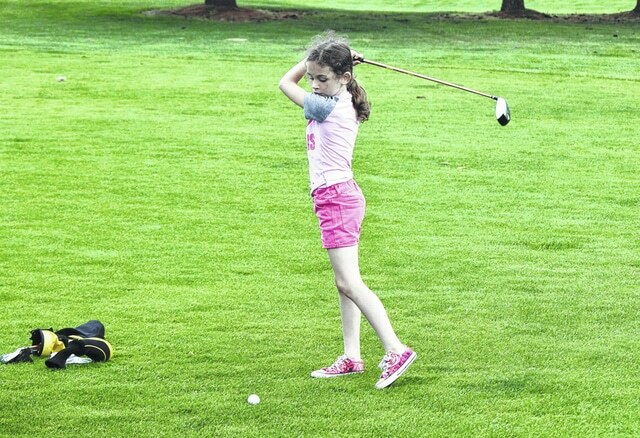 Elanor Luce, a second grader at Crestwood Elementary in Swanton, works on her swing at the Little People’s Golf Clinic held at White Pines Golf Course on June 8. The Swanton Elks Lodge held their 18th annual Little People’s Golf Clinic on Monday, June 8 at White Pines Golf Club, hosting 40 kids aged six through 14 from as many as eight different schools. Coaches and players from local high school teams as well as Swanton Elk members comprised the 25 volunteers that served as instructors for the event. Following the practice session the young golfers went on to the course to try out their new found skills on four different holes. Once the golfing was completed they were treated to a lunch of hot dogs, chips and cookies in the clubhouse.